Creation Day 2 - Sky and Water Theme Activities begin Here! Show the children how to pull gently on the cotton balls to make them stretch out into different sizes. Glue them all over their sky/water paper! Materials needed: Blue and White paint and white paper. Let the children make different shades of blue to interpret what God's creation might have looked like after Day 2! Cut up pool noodles for another type of block. Swim in the noodles! Tell the account of Genesis 1:6-8 in your own words! When you say water, point down, when you say sky, point up. Repeat and have them point with you. Needed: A small spray bottle of water, wrapped in Polyfil so that the children cannot tell there is a water bottle in it! As you read the account of God separating the water from the sky, squeeze the trigger of the water bottle rapidly to make it "rain" on the children! Have the children help you wash the berries. Give each child a handful and encourage them to count them into their cups. Allow them to scoop some whipped cream (clouds) over their berries (sky)! Today, provide blue paper, cotton balls and glue sticks for the children to decide where the water and sky are! Provide washable markers at your easel. When the children are done creating, spray with a water bottle! Provide large sheets of paper outside and spray bottles with watered down paint!! We have learned that God created light and now has separated the sky from the water! Make rainbow clouds by cutting up pool noodles into 6 inch pieces. Toss these into baskets or boxes for gross muscle development. When done, place them in your block center for added building fun! Sky and Water Theme Activities to help your Preschoolers develop those small muscles in their hands! Provide blue and white pom poms (sky and water), muffin tins and tongs. Encourage the children to count 2 pom poms into each compartment. They will find many ways to sort the two colors, believe me! Creation Day 2 - Sky and Water Theme Music and Movement Activities and Ideas to get your Preschoolers Movin' and Groovin'! And it was good! It was good! Sky and clouds, sky and clouds. That was on the second day. And it was good! It was good. Creation Day 2 - Sky and Water Theme Activities for the Senses! Mix in a ratio of 4 cups of flour to 1 cup of baby oil. Let the children help you measure and pour. Give them some wooden spoons and have at it! They mix and squish it to make some pretty cool clouds! Add blue coloring to your water today. Add cotton balls! Creation Day 2 - Sky and Water Theme Science Activities--for your Preschool Scientists in Training! Fill bottle 2/3 full of water. Add a few drops of food coloring. Pour in vegetable oil until about an inch floats on top of the water. Cover bottle and seal with hot glue gun. Show children how to move it to make waves. If they shake it they can watch the ingredients separate. Make several, these will be popular! 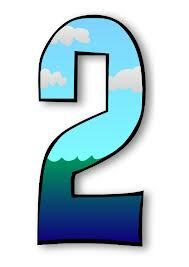 Writing Activity Ideas for Your Creation Day 2 - Sky and Water Theme! Provide Q-Tips, baby oil in a shallow dish and plain paper (like photo copy paper). The children print their names with these "cloud" pencils on the paper. The baby oil makes the paper translucent!